I hope you guys enjoy the photos. There will be a new outfit post live tomorrow evening! Today's outfit details, a cool mural I found in Marbella, coffee time and some gorgeous gifts from Onjenu London, which you'll be seeing here on the blog very soon! My dog, Scruffy, making it impossible for me to work, dancing beneath the trees at the Gibraltar border crossing, the cutest little cafe & palms in Gibraltar. 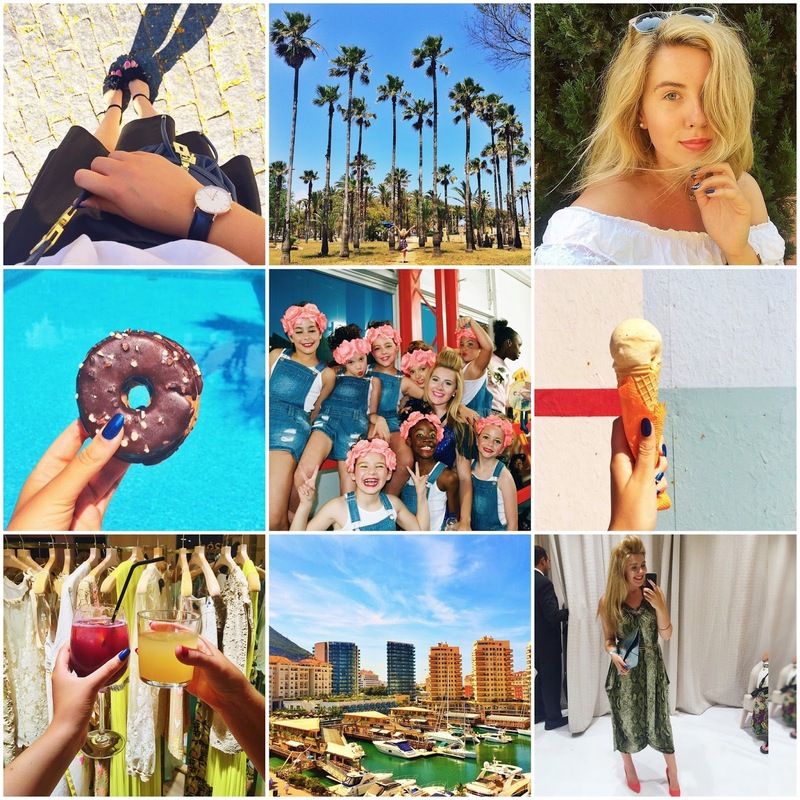 My obsession with palm trees continues, selfie time, OOTD snap and keeping fit on a walk. Treating myself after some blood tests, having some yummy, healthy smoothies, working from a local cafe and indulging one more time. Some behind the scenes shots from a recent shoot at my favourite place in the world: the beach. The Hoss Intropia Party, another quick selfie and an outfit I wore to dinner with my family recently. Enjoying the breathtaking views at Gibraltar's Europa Point, ice-cream time and checking out of the beautiful Sunborn Yacht Hotel. Backstage at the GISF with the most adorable little dancers, just before I went on stage, the incredible view from the Sunborn Yacht Hotel in Gibraltar and the delicious breakfast on our last day. Trying really hard to remain relaxed in the lead up to the GISF, by chilling by the rooftop pool on the Sunborn Yacht Hotel in Gibraltar, plus a quick snap of the famous Rock of Gibraltar. Trying out some eye gems on our first night in Gibraltar, enjoying the most beautiful sunset, constant smiling & the view of Gibraltar's port from our hotel room. The last few rehearsals in the lead up to my performance at the GISF, the announcement of my official music website, HannahHawkshaw.com (click here) and the most amazing, custom-blinged sneakers!! Airport views, walks in the beautiful Irish countryside, sun rays in Dublin and the Teenstars All Ireland Final. BTS @ MY MUSIC VIDEO SHOOT! Hair touch-ups, between takes, ending day 1 with a magical sky and fun with the cast on set! Another BTS shot from my video shoot, yummy hotel breakfast in Torremolinos during a very impromptu trip, hotel views and a big hat selfie.